Implementing a Material Ripple Effect style is now as easy as it gets, simply using the Vue Ripple Directive. This directive was created to be applicable to any element you would like to achieve such an effect. Watch the ripple effect utilizing the directive in the following demo. 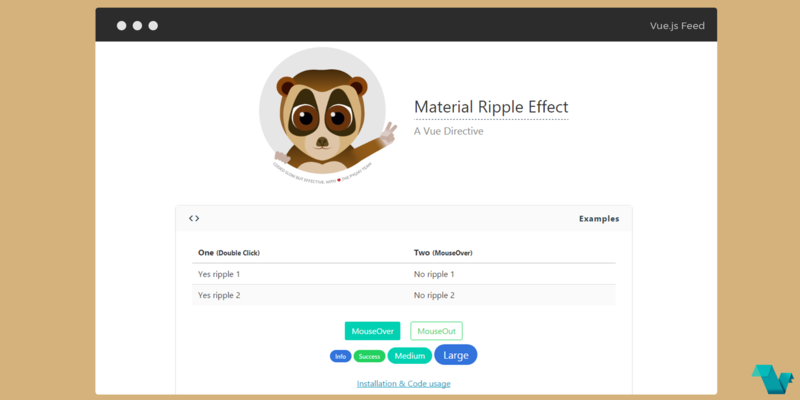 Follow a simple example below to see the ripple effect in a Vue.js project. The directive can be used with modifiers as seen above. If you want a custom color just pass a color parameter as a string. It's best if you use RGBA colors to achieve a greater effect. Find more about this project on its GitHub repository.